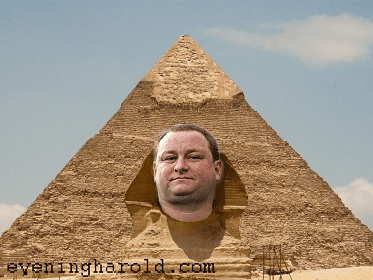 Concerns are growing over the conditions facing Sports Direct employees after it emerged that most of them are now spending 12-hour days slaving over the construction of pyramids under the harsh desert sun. The company has long had a reputation for poor treatment of staff, with zero-hours contracts, below minimum-pay wages and frequent beatings, but this is thought to be the first time that workers have actually been roped to huge blocks of stone and whipped until they dragged them huge distances on crude rollers. The company controls a wide variety of famous brands, including Dunlop and Slazenger, but never before has it diversified into enormous burial sites. An undercover reporter from the Evening Harold who managed to get a job with Sports Direct was unable to report fully on the terrible conditions after being thrown to the crocodiles after arriving a minute late to work – apparently a common occurrence. Sports Direct’s billionaire owner Mike Ashley gave a robust defence of his employment practices to journalists, before throwing them to the crocodiles.